EMMA: Sometimes it’s easier to tell lies than it is to tell the truth. ANNA: We could pull this one off, no problem at all. MARIAH: You’ve told lies before, haven’t you? Everyone’s told lies. One Friday night Emma, Anna, and Mariah, three best friends, are out doing something they shouldn’t. Then a cell phone rings. One girl’s mother wants to know why they aren’t where they said they’d be. They make up a story so they won’t get in trouble at home. It seems like the easy way out. What happens next challenges their friendship, their community, their relationships with their families, and their sense of themselves. What happens next shows the harm one lie can do. 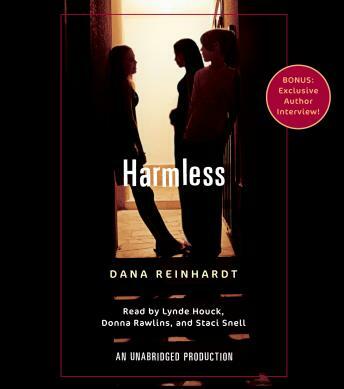 Told in the voices of the three girls who must learn to live with the lies they tell, Harmless is a gripping and provocative audio full of startling turns and surprises.